The American Short Stories Reading Group is back for 2019! Group members read two short stories each month and then discuss them in an informal setting led by English Professor (Emerita) Susan Nuernberg, Ph.D. 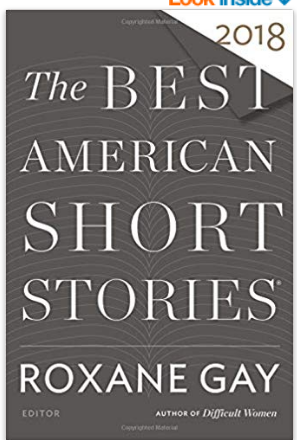 The stories are featured in the book, Best American Short Stories of 2018, edited by noted author Roxane Gay. We discuss each story in depth, focusing on point of view, use of language, emotional impact, ambiguity, plot and characterization. Once you register, we’ll send you a detailed discussion guide as well as a list of dates and the stories to be read for those dates. Required book: The Best American Short Stories of 2018, edited by Roxane Gay. The paperback volume is widely available at bookstores and online for about $15. Dates: The first Tuesday of each month from 4:00-5:30 p.m. in suite B 6637 Oakmont Dr. (next to the OVA offices). Registration: Our group is limited to 25 members, but we have a few openings. If interested in joining, please contact Julie Linder at jlinder2@prodigy.net and include your contact information. This entry was posted in Shorty Story Reading Group. Bookmark the permalink.